If you drove through Waikiki lately you probably noticed that they're busy tearing up the sidewalks and installing new slate tiles for the APEC Summit (Asia-Pacific Economic Cooperation) 2 months from now. 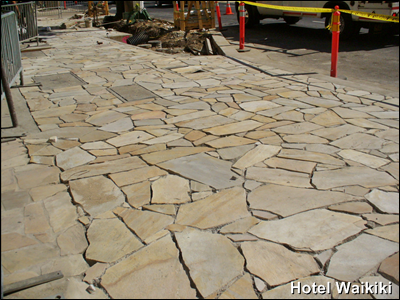 21 heads of state and dignitaries from the pacific rim member nations will have something nice to walk on. I don't know if the average citizen will be allowed to share the same sidewalk because of security reasons when presidents and prime ministers are strolling around taking in the T&A (teeths n' buttocks) on the beach. I'm sure every APEC nation wanted the summit to be held in their capital, but thanks is due to local boy, President Obama, who scheduled the event here. Somewhat related, they finish paving the roads in Waikiki town even many of the side streets which is nice. 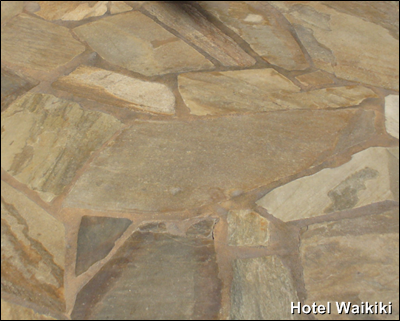 This is an older section of sidewalk with the same slate tiles. That's after they tore out the previous square tiles and re-tiled the sidewalk with slate. IMHO, not the best wearing material. Ummmm... Where is this money coming from? We had a similar thing happen here. The Ali'i sidewalk in front of the break water has been blocked off, and no signs of it being repaired since the March tsunami. J wondered if they would have it repaired for Ironman. He was skeptical, but I assured him that it would look all pretty in under a week. Sure enough, we went to town this weekend, and the sidewalk was repaired and looking spiffy. kahuku- Well, at least the sidewalk's fixed whatever the motivation. Your comment was in my moderation folder.